Violinist Christine Frank is fortunate to perform a great variety of music, from the symphonic masterpieces of the 18th century to the brilliant TV animation scores of today. As a member of the Pacific Symphony and the Hollywood Bowl Orchestra, she has performed with classical icons such as Plácido Domingo, Yo-Yo Ma, and Itzhak Perlman, as well as popular superstars like Willy Nelson, Bernadette Peters, and the Blue Man Group. Chamber music performances have taken Christine to the music festivals of Aspen, Santa Fe, Norfolk, and Costa Rica. She performed across the United States with the Anacapa String Quartet, and premiered and recorded many new works as a member of Southwest Chamber Music. The Southwest recording of Carlos Chávez's chamber music won a Grammy Award in 2004. 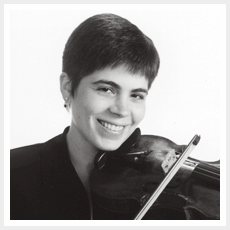 Christine enjoys teaching violin to young beginners as well as advanced students. In addition to a small private studio, she teaches at Long Beach City College and Pacific Symphony's Santa Ana Strings. She has coached and performed at the San Diego Chamber Music Workshop and Apple Hill Center for Chamber Music. Christine grew up in Vienna, Virginia and studied at the Cleveland Institute of Music (Bachelor of Music) and Yale School of Music (Master of Music). Her teachers have included Syoko Aki, Linda Cerone, and David Updegraff. She studied chamber music with the members of the Cavani, Colorado, and Tokyo String Quartets.